A charity raising $1 Million dollars in a years time isn’t that unusual. Except for the Chiroideremia Research Foundation. The most they have raised in one year is $540,000 in 2012 for my year of 12 marathons. The point of raising the million is to get more people involved, more people fundraising. I spoke with Dr Jean Bennett just a few days agofor my podcast , she is in Philadelphia, and wants to start Human trials this year. She wanted to do them years ago but the funds weren’t there. The million raised will go to the Choroideremia Research Foundation and I’m sure they will be involved with Dr Bennett’s goal. I’m promising to personally raise $50,000 this year. I just need others to help, too. Fundraising, donating, retweeting, reposting, emailing, supporting, talking, spreading the word any way possible about what we are doing. The more money raised the sooner we will find a treatment. The more time that goes in the more sight that will be lost forever. I am legally blind, my brother has this disease, my 9 year kid and 5 year old nephews have it. My grandfather went blind from it early enough I never knew him as a sighted man. The ONE MILLION DOLLAR Goal!! The CRF has never raised $1 Million Dollars EVER in a single year. Id like US to change that in 2014. But I need YOUR help!! The most Ive ever heard the CRF has made is $540,000 in a year in 2012. If we can get more people fundraising the $1,000,000 is a very realistic goal. The race to a cure or a treatment is slowed down considerably by lack of funds. I think if we can work together (CHMers, carriers, friends, family, strangers) making a million (or more) WILL happen! If I’m emailing 50 people. If each person raised an average of $20,000. We will reach our goal. If 100 people can raise $10,000 we will reach our goal. I will make a goal for next year for myself to raise $50,000. Ive been able to raise that much the last 3 years so I think I can do it again. I have fundraising ideas for my area. If I dont make it, it wont be from a lack of trying. I think first set a goal for yourself. Even if its $500, $1,000, $10,000, etc. Go for it! If by the end of 2014 you dont reach your goal, nobody will put you down for it. You set a goal and you went for it and thats already a success. (I may not reach my $50,000 goal but I’m gonna try). Get friends and family involved. Reach out. Let them know what we as a Choroideremia community are doing. I bet a lot of people will step up with ideas and offer help. In my experience, the more you put out the more you get back. Take advantage of social media. Reaching the masses is literally at your finger tips! You can get donations from around the world! Theres no way I wouldve made what Ive made the last few years without Twitter and Facebook! its true! Anything can be an idea!! If you have done a previous fundraiser maybe you can do that fundraiser again or try a new idea. If youve never done a fundraiser before and dont know how to get one going, you dont have to over think it. Do you play the piano? Maybe offer lessons for donations, or dog walking, or house sitting, baby sitting, for donations. I sell stuff on ebay.com. Ive made approx $30,000 selling stuff on ebay. Ask your friends and family if they would go through their house and garage and donate things to you to sell online. People offer me things all the time to sell for the foundation. I also use Crowdrise.com to do online raffles and the money goes to the CRF. (You can link the foundation directly to Crowdrise and eBay. When money is raised it goes straight to them). Raffles and auctions always go great at live events. A big chunk of money can be made by including these in your live events. On Holidays/ Birthdays ask friends and loved ones to make a donation instead of a card or a gift. Use Twitter and Facebook to tell others. Do you know any bands? How about a night of music in someones back yard or bar or another venue? Do you have a local church? Reach out to them. Im sure they would allow all sorts of fundraising there. –Sports Centered Fundraiser – The King family in Chicago had a sports centric fundraiser that made $35,000 very quickly in 2012. Maybe they can help give advice to others that would want to do that. Do a marathon, triathalon, mud run, bar crawl, whatever. And ask for sponsorship from friends and family. Simply sign up for an organized event, email friends and family, tell them what youre doing and what for. Donations will come from it. Post about it online. Lose Weight for the cure – In 2009 I lost 70lbs and was sponsored by friends and family and strangers. I raised $14,000 and got healthy! That lead way to my marathon ideas. What is available to you? If you cant think of anything and none of these ideas work for you, talk with your friends and family in your area. Brainstorm and come up with something. YOU CAN DO IT!!! Here is a link to some CRF fundraising ideas. I’ll be emailing everyone in my email list and encouraging them to email everyone they know and so on. Local press would be great. National press is even greater. The more people that know about this the more awareness and money will be generated. I hope you guys will email everyone you know and encourage them to spread the word. And let your social networking friends and followers know as well. This can be a really great way to not only raise money but raise morale and awareness for the cause. This is a genetic disease and will continue through the generations unless its stopped. And WE CAN STOP IT! But we have to work together and encourage others to help. I think this could be a very infectious year. 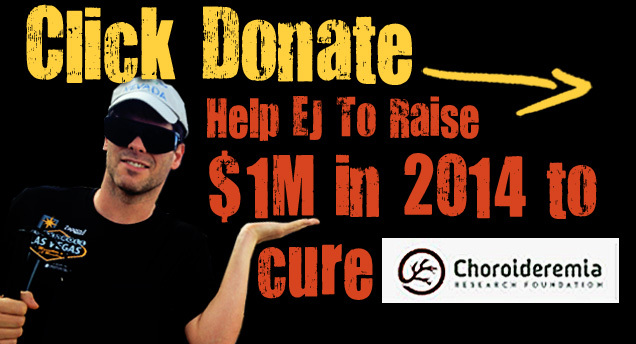 If we reach our $1,000,000 in 2014 I bet it’ll be easier to reach every year. Feel free to contact me with questions. If you are unable to fundraise, I hope you will consider donating and helping spread the word and goal for the year. This can be the best year for the CRF yet!!! I hope I can count on everyone’s support. Thank you so much!